Pasco-Hernando State College is helping one of its students get an education and a new house. WESLEY CHAPEL, Fla. — Marine Cpl. Timothy Read was in Afghanistan on October 15, 2010, when he stepped on a homemade explosive and lost his left leg. “Under Murphy’s Law of Combat, the easiest way is always mined,” says Read, with a quiet dark humor. Read walks today with the use of a prosthetic and a support dog named Shadow, a fellow veteran who also served in Afghanistan. Also by his side is his wife, Anh Lan Du, whom he met when she was working in the prosthetics department at the James A. Haley Veterans’ Hospital in Tampa. Read is now an inspiration not just for his time in the military but for what he is now doing after it. He is studying at the Porter campus of Pasco-Hernando State College in Wesley Chapel. He would like to pursue a degree in mechanical engineering to start a non-profit car racing team to help bring attention to and empower other veterans . “I didn’t expect to be rallied behind by a college,” Read says. 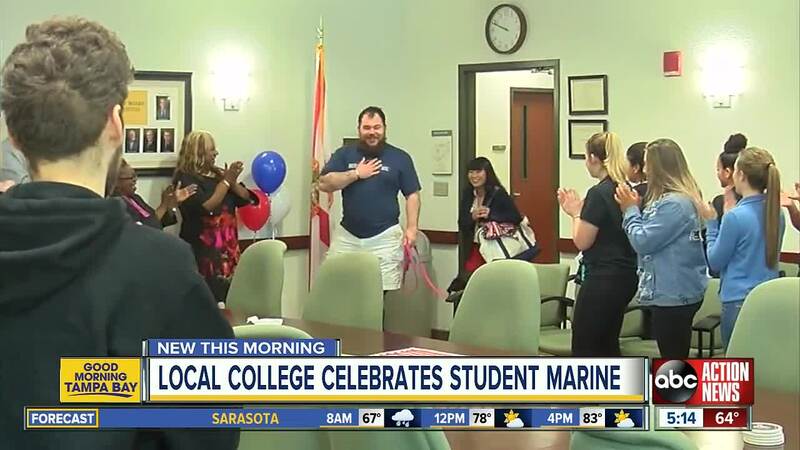 Because of his remarkable service, college pursuits and desire to help other veterans like himself, the non-profit Homes for Our Troops selected Read to be the recipient of a new house. Pasco-Hernando State College plans on helping Read with whatever it takes to get him settled in his new home. The house will feature wider doorways and specially fitted showers to suit Read’s needs. “As a father of two sons, I have a 1-year-old and a 3-year-old, Tim is the kind of man I want my boys to become,” says college provost Dr. Kevin O’Farrell. Read says the kindness the college and non-profit showed to him will be paid forward. “It’s really about doing what you can do in this one life that you have, and living for your brothers who weren’t able to make it,” says Read.